A rogue chunk of debris that orbited Earth far beyond the Moon is making a homecoming on November 13th, astronomers have concluded. WT1190F is one to two meters in length and probably hollow, but beyond that, we have no idea WTF the aptly-named piece of space garbage is. Much, if not all of WT1190F will burn up in orbit around 06:19 GMT on November 13th. Any remaining fragments will splash into the Indian Ocean just south of Sri Lanka, so if you were planning a fishing outing on that very day, maybe reschedule. 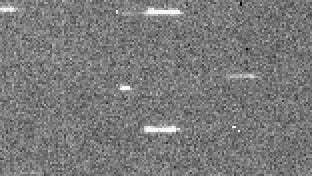 The event will go unnoticed by most of the world, but the astronomers who track near-Earth objects are all in a tizzy over it. WT1190F’s atmospheric re-entry is a rare opportunity for scientists to study how incoming objects interact with our atmosphere. It’s also giving astronomers the chance to test-drive a coordinated network they’ve put in place for occasions when more dangerous space objects comes a-knockin’. I just hope we get to learn what it is. While there are many thousands of piece of space trash — satellite fragments, spent rocket stages, old paneling — orbiting close to the Earth, we’ve only tracked 20 or so artificial objects in distant orbits. WT1190F, with a highly elliptical orbit tracing twice as far out as the Earth-Moon distance, is a pretty special piece of trash. As Harvard astrophysicist Jonathan McDowell told Nature News, it could be a “lost piece of space history come back to haunt us,” perhaps an old rocket fragment from the Apollo era. Now that’d be a pretty cool thing for humanity to rediscover — even if it’ll be gone in a flash.